The utility industry is ripe with analytic opportunities. Usually, when I share that perspective, thoughts immediately jump to making the energy grid more efficient. Certainly, there are efficiencies to gain with improved data about where power is being consumed and the sources that are available to support it. However, there are also direct financial benefits to be gained in the area of revenue protection. It may surprise you, but utilities around the world lost an estimated $89.3B in revenue from individuals who do not pay their bills or who tamper with their smart meters to avoid incurring charges. As we get into peak season for winter heating, I'm reminded of the opportunities to ensure that utilities’ customers don’t have bill shock, which is an unpleasant situation and a drain on customer satisfaction. And keep in mind, utilities have the tools to track down those who may choose to defer payments for another time – or never. 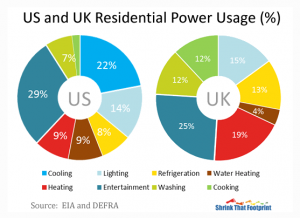 As you see from the chart below, the largest driver of electricity consumption is “entertainment” activities. This includes our televisions, home networks, stereos, computers and household fun like beer-making. While we are creatures of comfort, we certainly wouldn't want to miss the next episode of our favorite show just because we forgot to pay power bill last month! If you live in a climate that has hot summers and cold winters, you may have been offered a program to have a consistent bill amount each month. This helps customers manage energy expenses and also provides more consistent revenues for utilities. If needed, there's a true-up at the end of the year to reconcile usage with payment. This eliminates the need for high bill alerts and increased call center costs to handle the calls that come in to resolve a high bill. In Australia, Origin Energy has a first of its kind “Predictable Plan.” This means that your flat monthly rate covers any level of usage – whether higher or lower than expected – with no end-of-year reconciliation. No matter how much you use! This offer is enabled by robust energy forecasting, which can predict hourly and daily consumption well in advance. This reduces the risk to Origin Energy and provides customers with a unique energy offer. For the utilities that still experience energy theft in the system, analytic techniques are available to reduce false positives and prioritize collection efforts. Cemig in Brazil is one of the largest utilities in South America. They were able to detect losses in the electric system and identify cases for investigators to pursue. As a result, they're able to capture revenue for the services already delivered to customers, at a value of roughly $500,000 each month or $6 million a year. With these analytic capabilities, utilities now have the power to know which customers are paying their heating bills, which are likely to default, and what programs they can put in place to ensure that everyone stays toasty and warm during these holidays. Want more info? Check out SAS Utilities solutions. Alyssa Farrell leads global industry marketing for SAS’ business within the energy sector, including Utilities, Oil and Gas. In this role, she focuses on the SAS solutions that help optimize our energy infrastructure by applying predictive analytics to complex data. She currently serves on the Advisory Committee of the Research Triangle Cleantech Council and co-leads the Program and Communications Action Committee, as well as a Working Group of the Utility Analytics Institute. She is a member of the Society of Petroleum Engineers (SPE). Farrell regularly speaks with trade associations, analysts, and the press about the opportunities organizations have to effectively manage a sustainable energy analytics strategy and drive healthy economic growth. Prior to joining SAS, Farrell was a senior consultant in the Deloitte Public Sector practice. In this capacity, she was a project manager for state-wide and county-wide systems implementations and was responsible for user acceptance testing, change management and training, and middleware technology selection. She is a graduate of the Eller College of Management at the University of Arizona, where she earned her MBA degree with a concentration in Management Information Systems. She also holds a Bachelor of Arts degree from Duke University.